ᗯᗩᔕ $7895.00+GᔕT "ᑎOᗯ OᑎᒪY $5750+GᔕT"
From any angle, this aluminum block is the class of the SBC field. The exclusive horizontal ribs that set the MOTOWN apart from all others serve several important functions, such as stabilizing and reinforcing the cylinder walls and enhancing cooling. They look cool too. There are also reinforcing ribs in the valley that connect the banks and add stability to the lifter bores. The ribs are drilled to cross-feed the lifter galleys. 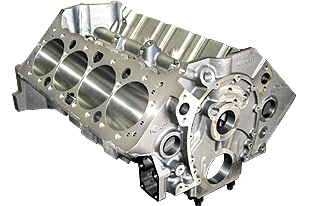 What’s more, the block is configured for priority main oiling to assure that the crankshaft is lubricated before the lifters.